What caught my attention in the views of the speakers and the following discussion was a tendency to see collective identity as a vehicle for emphasizing difference (often social or ethnic) rather than what is shared or common. Although I find this way of looking at the topic counter-intuitive, it is important to understand aspects of collective identity that lead to social exclusion. This text therefore does not report on the evening’s proceedings, but examines how some of the addressed points manifest themselves in the contemporary city, both spatially and digitally. In talking about collective identity in the contemporary city, we need to look back at some of the technological and societal changes that took place during the last century. Industrialization and globalization led to the emergence of large cosmopolitan cities as we know them today, but it was the information age that stimulated the tendency towards personalization. Digital technologies played a significant role in shifting the way social groups are defined from geographical location to shared interests, which turned them into market profiles. While the global village was supposed to bring us all closer, it did in fact lock our relationships into enclosed, self-absorbed groups. We have been moving further away from one another, detaching ourselves from forms of collective identity that reach beyond the realm of marketing. According to its sociological definition, collective identity reflects a group’s common interests, experiences and solidarities. (2) It is a way to express one’s belonging, and can be tied to a shared political or cultural realm. The term emerged from studies on social movements conducted by Alberto Melucci in the 1980s. He aimed to define what motivated individuals to act together in a particular way. So the notion of collective identity in its origin relates to action and shared goals. Today, however, we face a new type of association: the digital or modern tribes that sprout from digital culture and consumer profiling. Identity is also very important to tribes, but the collective dimension they address is defined within a different scope than that explored by Melucci. “Tribes are loosely connected groups defined by their appearance, identity and rituals.”(3) They do not share goals or spaces, but build relationships based on specific interests, such as watching ‘Lost’ or playing Pokémon Go. They come together quickly, but are fleeting in character. Their members identify with one another, but what they form is closer to a random gathering than a collective. This type of loose, superficial identification pretends to stand for collective identity today, but is in fact something else, and it is not merely an online-specific phenomenon. The effects of both personalization and tribalization have similar manifestations in space. Recent years have seen many positive examples where online media acted as an aggregate for expressing a collective identity as defined by Melucci. Cases include the Occupy movement, and most importantly the Arab Spring. But they also acted in quite the opposite way in the case of the Brexit campaign and the recent American presidential election. In the first two cases, online media supported the formation of collective action by protesters and their supporters to share information. It gave a group of people who had a common goal a sense of power. In the last two cases, the ‘Vote Leave’ and Trump campaigns drew on the dissemination of fake news to feed anger and a sense of hopelessness caused by inequality. (4) Group identity was defined not by similarity and common goals but rather by differences. Instead of uniting voters around a common political goal, they focused on turning them against something or someone. The algorithmically based dissemination of information, designed to cater to individual preferences, did the rest by enclosing these messages in circles of shared interests and enhancing their influence by virally spreading them within the echo chambers. In both cases, they had a big influence on the result of the vote. Following these precedents, filter bubbles became an important topic in discussing digital culture, and we turned our attention to the changing role of social media from something we saw as bringing us closer to something that has ultimately become divisive. The idea of isolation and antagonistic separation is, however, not only visible online. For years we have been observing such a divide in the realm of the city and its architecture. The reflection of growing inequality continues to be seen in aspects such as the privatization of public space, sprawling central business districts (CBD) and their iconic architecture, swapping shopping streets for shopping malls, and building impressions of safety and exclusivity in gated communities. In a city where the public realm is fragmented into filter bubbles and, as mentioned by Richard Sennett, focused on boundaries instead of porous borders, people will have very little in common with each other. And instead of living together, they will live next to each other, without common goals or any forms of solidarity. Unfortunately, even if it often appears to be true, we cannot always really decide which places we can access and where can we live. It is usually decided for us, by city politics, by the shaping of the city’s profiling and the type of ‘clientele’ it wants to attract to specific neighbourhoods or to exclude them by offering classy buildings, hyped developments or good access to infrastructure. These imposed decisions project an identity on the citizens and group them according to their social status or cultural background. It not only creates antagonisms represented spatially but also traps groups of inhabitants in their own enforced identity, depriving them of the possibility to choose. Even if clichéd, one of the most striking images of a spatially stigmatized divide is the boundary between luxurious condominiums and slums, for example that between Morumbi and the Paraisópolis favela in Sao Paolo. Similar examples are plentiful and exist in most cities. In many cases, however, they are not as prominent and visually striking, but tucked away out of public view, to avoid criticism and demands for social justice. Even if we cannot always see them, drastic social divisions are hiding everywhere. 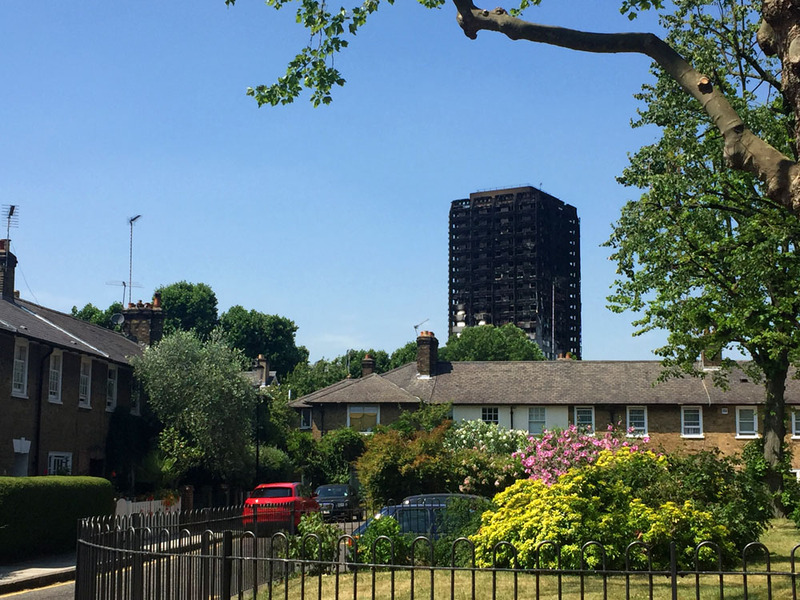 The recent tragic fate of London’s Grenfell Tower, located in one of the richest yet deeply economically divided boroughs of the UK, is another terrifying example of how social fragmentation can manifest itself in space. (5) The renovation of this social housing complex was supposed to improve living conditions by enhancing the thermal quality of the apartments but was realized poorly owing to savings on the quality of cladding(6) and did not include a sprinkler system, which could have saved lives. (7) As noted by the press, it was in fact also meant to improve the appearance of the tower to make it more appropriate in the high-end borough(8), despite the fact that Kensington is one of the most popular “buy-to-leave” areas and that many of the tower’s sophisticated neighbours are full of unoccupied apartments. (9) In spite of many complaints about the quality of the work and concerns about fire safety, residents were brushed away, and in one case even threatened with a lawsuit. (10) Many observers agree, however, that this would never happen to inhabitants of any ‘wealthier’ buildings in the area, who as quoted in The Guardian are “a few hundred yards away, but worlds apart, from one another.”(11) How is it that the largest number of fire casualties in post-war Britain was caused by ‘beautification’? The example of Grenfell Tower exposed the lack of responsibility for the safety of residents and a basic level of human solidarity. Leaving aside all possible ethical aspects of architecture, cheap image enhancement was important enough to sacrifice lives. And that image was ironically intended to soften up the look of a social housing block that once proudly represented the ideals of the British welfare state. So what does it mean today to engage with collective identity in architecture in a fragmented and privatized city that does not follow an egalitarian ideal? According to Charlie Koolhaas, societal ties today are more economic than cultural. Our cultural identities in the globalized world survive only in hybridized forms and watered-down versions adjusted to white western standards representative of global capital. These remixed identities enable us to ignore one another by superficially normalizing differences and making coexistence more ‘user-friendly’. In such a way, identity becomes divorced from solidarity, rendering the collective and cultural aspects completely insignificant. In this context, it is hard to disagree with Richard Sennett that ‘we’ is the most dangerous of expressions, one that divides and closes doors rather than leaves open, porous gaps. According to Sennett, modern cities are built with edges, which have boundary conditions that separate and create fake shields supposedly protecting us from the others. We live next to one another but remain permanently separated, tolerating one another with the help of politeness and political correctness. The idea of user-friendliness and frictionlessness is shaping our attitude and expectations, while in reality we should not only learn from the resistance of the other and be exposed to differences, but also define forms of solidarity to make good cities. As much as I agree with the ideal of porosity and embracing friction, especially a cultural one, I do not think that negating the ‘we’ is something that can help us to break away from the anti-social forms of polarization. The fear of the ‘we’ only opens the notion of collective identity to possible hijacking by exclusionary groups, who will seize their chance to determine who can belong to them and what territories they will occupy. It is about not only embracing friction but also accepting that ‘we’ together share responsibility for one another. Collectively, we must turn back to goals that matter in a broad humanitarian sense and advocate for cities cherishing values that reach beyond forms of collective identity that manifest themselves solely through profitability. Architecture is often said to stand between the arts and sciences, but it seems that its relation to the humanities seems to have been forgotten — focusing too much on looks and technology rather than on its social role and responsibility. 1 ARGUS, Night of Philosophy, About [Us]: Architecture and Collective Identity in the Contemporary City, 15 June 2017 at Het Nieuwe Instituut. The Dutch contribution to the Venice Architecture Biennale 2014 looks at the work and research by Jaap Bakema (1914-1981) into the notion of the open society (democratic, egalitarian and inclusive). During the biennale ArchiNed brought the discussion about the open society into the present.